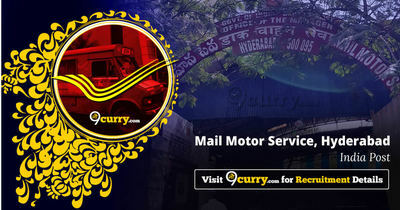 Mail Motor Service Hyderabad Recruitment 2019 - Job notification for Staff Car Drivers Posts in Department of Posts, Mail Motor Service Hyderabad, Telangana on Deputation Basis. Applications are invited by Mail Motor Service, Hyderabad on or before 28 Feb 2019 for 3 vacancies. Max- 56 years as on the last date of receipt of applications. ii) Knowledge of Motor mechanism (The candidate should be able to detect and rectify the minor defects in the vehicle). iii) Experience in Driving for Light and Heavy Motor Vehicles for at least three years. iv) Pass in the 10th Standard from a recognized Board or Institute. From amongst the regular Dispatch Riders (Group-C) and Group-C officials in [Pay Band-1 (₹5200-20200 with Grade pay of ₹1800 as per 6th CPC) and Level-1 in the Pay Matrix as per 7th CPC] in the Department of Posts possessing valid Driving License for Light and Heavy Motor Vehicles on the basis of Driving test to assess the competency to drive Light and Heavy Motor Vehicles. Eligible candidates may send their application in prescribed format (attached below) through proper channel to The Manager, Mail Motor Service, Koti, Hyderabad - 500 095 on or before 28 Feb 2019, along with photocopies of the ACRs/APARs for the last 5 years duly attested by an officer of the rank of undersecretary to the Govt. of India. MMS Kolkata Recruitment 2019 - Job notification for Staff Car Driver Posts in MMS Kolkata, Kolkata, West Bengal on Direct Recruitment. Applications are invited by MMS Kolkata within 60 days from the date of publication of this advertisement in Employment News up to 1700 Hours for 9 vacancies. Mail Motor Service Hyderabad Recruitment 2019 - Job notification for MV Electrician & Painter Posts in Department of Posts, Mail Motor Service Hyderabad, Hyderabad, Telangana. Applications are invited by Mail Motor Service, Hyderabad on or before 30 Apr 2019 till 05:30 PM for 2 vacancies. Mail Motor Service Patna Recruitment 2019 - Job notification for 10 Staff Car Drivers Posts in Department of posts, Mail Motor Service Patna, Bihar on Deputation Basis. Applications are invited by Mail Motor Service Patna on or before 07 May 2019 for 10 vacancies. Mail Motor Service Madurai Recruitment 2019 - Job notification for Staff Car Driver Posts in Department of Posts, Mail Motor Service Madurai on Deputation Basis. Applications are invited by Mail Motor Service Madurai on or before 21 Apr 2019 for 2 vacancies.